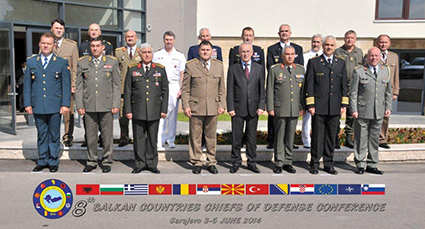 The Annual Meetings of the Chiefs of Defence/General Staffs of the Balkan Countries is a regional initiative. The main aim of this forum is to enhance military cooperation at all levels and to improve relevant capabilities of the states within the region in order to be able and ready to respond adequately to potential asymmetric threats and non-military crises. 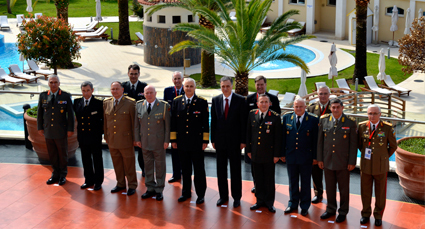 On 18.04.2007 the Chiefs of Defence / General Staffs (CHODs) of the Armed Forces of the Balkan Countries during a Conference held in Thessaloniki confirmed their will to improve multilateral military cooperation, between their countries, in order to coherently meet the regional security challenges. The enhancement of the military cooperation will further underline the vital role assumed by Balkan Countries, in the International Organizations and Alliance, which they belong to. During this conference a draft of "The Terms of Reference of the Balkan Countries' CHODs Conference on Military Cooperation” has been discussed and the formal signing of this document took place on 10.05.2007 in Brussels. The main aim of this initiative is to promote stability, cooperation and well-being of the countries in this region. In accordance with the abovementioned document, the participants committed themselves to cooperate in the development of military relations to improve and promote military cooperation within the region at all levels and contribute to the adequate response to potential asymmetric threats. In compliance with the TORs, member states established a CHODs Forum in order to coordinate cooperation efforts. This forum is held annually at CHOD level and each participating nation will host it on a rotation or an ad hoc basis. This forum is chaired by the Host Nation CHOD and supported by appropriate subject matter experts. 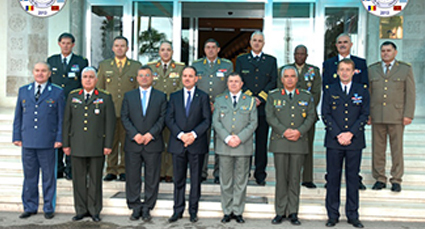 - To explore the new possibilities for military cooperation among the participants. All decisions concerning the agenda of each conference are to be made on consensual basis. Due to the fact that all participants are either NATO or EAPC members, nations agreed to follow NATO SOPs as appropriate. NATO Terms and Definitions are also applied for practical reasons. Coordination Group had been assigned in order to facilitate the arrangement of the meetings and initiation of relevant activities to be conducted. This team is composed of the Directors of respective Plans & Policy Branches or equivalent (OF-5 and above). Normally, the Coordination Group is chaired by senior representative of the nation, which will host the next CHODs Forum meeting. This group is to prepare and disseminate an annual progress report and make recommendations to the CHODs with regard to the way ahead. This report is to be submitted to CHODs Forum for endorsement. The Coordination Group Chairman is responsible for the promulgation and distribution of the minutes of the conference. - Unanimous consent of the full members. Each member nation could make proposals for amendments to the TORs. All members’ written consent is required before these amendments become effective. Each member state could denounce and pull out of TORs by giving relevant notice to other members at least 30 days prior to the due date.